It's been a busy week; work wise - hectic as you like. Plus I had the opportunity to give a talk at Kangei Koi Club on Wednesday about my project, and I'm heading to South Downs Koi Club this Sunday to do the same. There's so much detail to share about the selections from last weekend - and it's going to take me a week or two to get it all blogged. So this is a a quick heads up the things right now. The koi are growing well, seemingly despite the cold weather limiting my ability to heat the tank above 20C since the turn of the year. 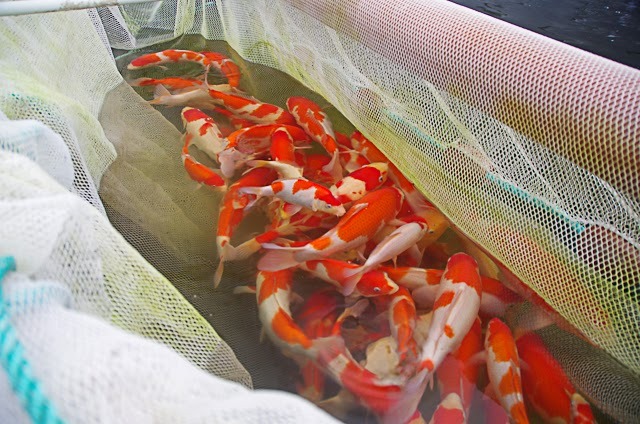 I've adjusted the mix of the food I'm using , and also the quantity fed to allow for the lower termperatures, and the increasing load on the bio filters caused by the the koi getting bigger. The tank tooled too busy and I felt there wasnt enough room for the larger and better prospects to flourish, with 60 or so koi at 30 to 40cm in there. Focussing on my project objective to win prizes at koi shows with my home bred koi - I had to give the best ones the best chance. So tough decisions need to be made. Plus, with the fish now at a decent tosai size, they were ready for the next selection. The weather this weekend is as warm as it's been for a while, raising the temp of my ambiant tanks by a degree or two. So with the ambiant tanks as warm as they've been for a while, I've been taking the growing on tanks' temperature down a bit so the temperature difference is small enough to enable me to move some fish out of the grow on tanks. With this short window of opportunity - If I can make the time, I'll also try and select out as many of the Jul 14 spawning too, and move them to the ambiant tank. But that might be too much of a stretch; we'll see. With pictures and video of all the key fish from the selections last weekend - I've gained enough material to start following individual fish with picture case studies. I laid some up for the club talks this week and they went down so well on Wednesday at Kangei, that I've gone back through my photo records and augmented them a bit - I'll start a new page on my blog with those case studies after I've given the talk to South Downs club on Sunday. They're only 9 months old!